This sidemount regulator kit is the perfect setup to go with the Scubapro X-Tek technical diving sidemount harness and wing. You get 2 sets of Scubapro's top of the range MK25 Evo / G260 regulators with one 64cm hose and another 210cm hose so it is ready to use in a standard sidemount routing. The Scubapro Sidemount reg kit also contains 2x pressure gauges which connect to the 2x 20cm high pressure hoses - this length is handy as it means you can easily check the pressure when required but also tuck them away neatly. There are 2x 20cm low pressure hoses included as well which can be used with drusuit / wings for easy inflation. The choice of the MK25 Evo first stage regulator means you have a swivel sytem on your first stage for ease of hose routing which is a key consideration when diving with a sidemount setup. Scubapro have also thought to include a hose elbow and regulator necklace for your secondary regulator to further ensure the set-up is comfortable and hose routing is easy. This sidemount regulator kit really does cover all of the bases you require when diving with a sidemount setup and with the top of the range Scubapro regulators you can use it in even the most challenging diving conditions. 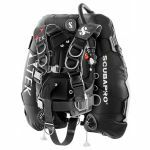 Who is Scubapro Sidemount Regulator Kit - MK25 Evo / G260 For? 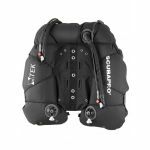 The Scubapro Sidemount Regulator Kit is designed to be used with the Scubapro X-Tek set-up for technical diving.